We erect many kilometres of pre-cast concrete walls and concrete palisade security fencing every year. The kilometres we install are made up of hundreds of small, typically residential, installations and a variety of large projects varying from a few hundred meters to many kilometres per project. The fact that professionals trust us to do their project installations, that we have been in operation for over 35 years and that we are very well known in the concrete industry, should tell you that we value our reputation. Much of our lasting success is based on repeat customers and word-of-mouth referrals. We believe in the very basic principles of providing our clients with a value for money product, excellent service and top quality workmanship. As a result of our many years of experience and first-hand knowledge we are confident that our concrete walls and fences will last a long-long time. To back-up and prove this confidence in our workmanship and material ALFA gives a 5 year guarantee. ALFAï¿½s factory is situated on the eastern side of Pretoria along Lynnwood Road about four kilometre past Silverlakes. Our premises border on Willow Quarries and assure a constant supply of excellent quality aggregate. 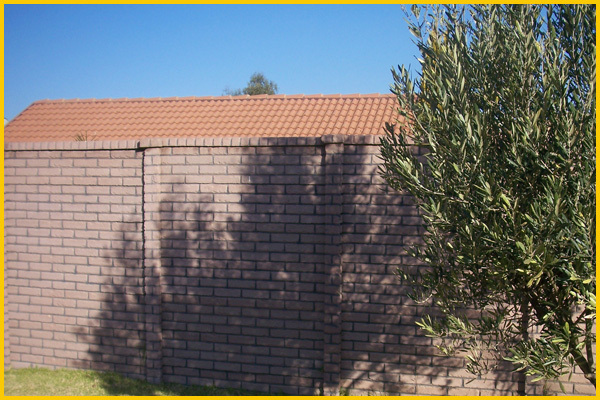 Our Brick Crete pre-cast concrete fences look authentic. The post and panel system enables our customers to build beautiful projects at a terrific price. Our concrete fence products are designed to provide you the rich appearance of stone, wood and brick in an endless variety of designs and colors. Our precast concrete walls are available in Gauteng and we can provide full turnkey installation or ship materials to your site. We design, manufacture and employ our latest concrete form technologies to ensure a superior concrete walling solution. Brick crete FenceStone, WoodCrete and our other proprietary brands have been successfully used for three decades for a wide variety of projects. For simulated stone, brick or wood there is simply no better solution. Call us or e-mail us today to find out more about our concrete fence and wall products or fill out the quick quote form for more specific information.